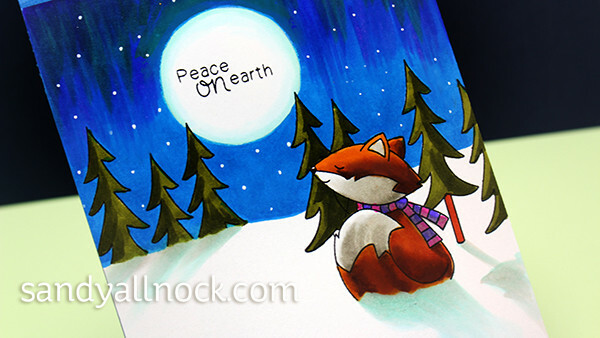 Welcome to my stop on the Newton’s Nook “Deck the Halls with Inky Paws” Bloghop! I’m a big fan of foxes….so when I saw the Fox Hollow set, I knew that would be my set of choice for this hop. Thanks to Newton’s Nook for sending the stamps! Lots of Copic colorists, whether experienced or brand new, struggle with picking Copic colors. Earlier this year I posted my Hex Chart for sale – and have been amazed at the feedback from so many about it! I wasn’t expecting it to be that helpful, but I’m delighted that lots of folks are having an easier time choosing colors. 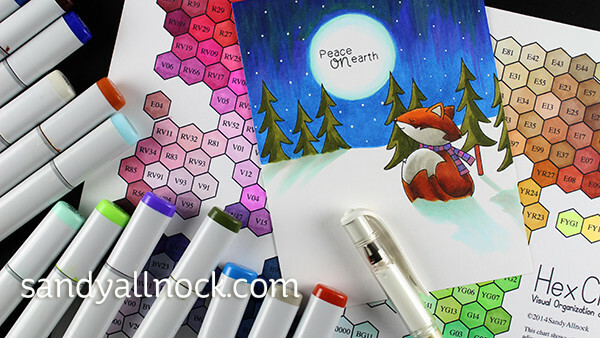 The hex chart comes with a fully colored pdf to print, and a black and white one for you to color with the markers you have. On the chart you can see colors in visual relation to each other…and sometimes you’ll suddenly see blending combos that you hadn’t thought of before. The chart puts colors next to the colors closest to them – so you want to pick markers a few steps away from each other to have enough contrast between the colors. Or, if you’re like me and don’t want to get up off the sofa to reink a pen, pick a color right next door that’s an adequate replacement! 🙂 Without further ado- let’s look at coloring the fox, as well as a new-for-me sky combo of colors. Watch the video below, or click HERE to watch in HD on YouTube! Newton’s Nook Designs is also having a Bonus Stamp Release Today! Make sure you check out their NEW Whispering Pines stamp set. This set is up for sale in their online shop starting today! Newton’s Nook will be choosing two lucky winners to win a $10 store credit for Newton’s Nook Designs online shop! To enter, just leave comments on blogs on the bloghop (see list below)! Two winners will be chosen at random from the collective blogs in the blog hop. You have until Sunday, December 6th at 9 pm CST to comment — winners will be announced on the NND blog on Monday, December 7th. I LOVE your scene cards. They take us to a magical place. 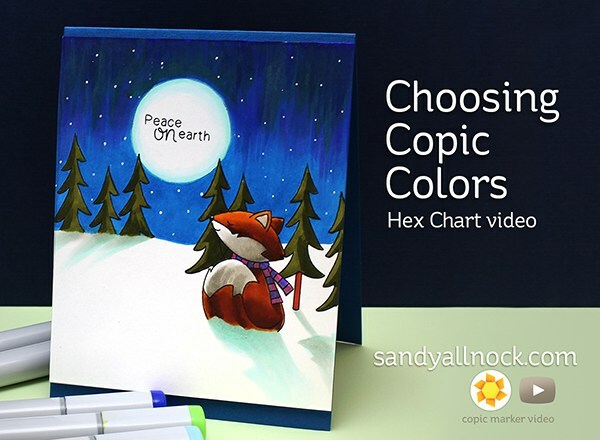 Hi Sandi, I bought the Hex Chart and haven’t received the download link for the chart yet. i wrote an email a few days ago and hadn’t heard. I thought it would be something automatic…I don’t know. sorry to have to bother you. could you please respond with my email and I can send you the paypal transaction number if needed. Wow!!! Your coloring is simply amazing! I have to say, your hex chart is a total must-have, so helpful ! Fabulous coloring on this delightful card! Your colouring is beautiful, Sandy! I love this little scene and the fox is so cute! Fantastic! You really inspire me! Lovely card! I especially enjoyed seeing how you colored the sky and the shadows. If I get more Copics I will get the chart you created–it looks like it is quite helpful! My goodness! That card is wonderful! This card is so gorgeous! I love the night sky and the beautiful scene you created! I love the hex chart tips too – This is so helpful! Thank you so much for being part of our Deck the Halls with Inky Paws blog hop!! Love the shading in the sky. Beautiful night-time card. Fantastic job, love the look of the night sky! I have a friend who is getting her daughter Copic pens for Christmas, the chart will be very helpful for her. I love the card designs. Best cat stamps I’ve ever found. Adorable scene and that fox is too cute!